Jean-Marie Straub and Danièle Huillet: Three Works comprises a video, film stills, an annotated script, and other materials related to three distinct films by Straub and Huillet. Each installation reveals the varying and complementary methods used to confront the challenges of presenting the moving image in gallery contexts, while providing an introduction to the renowned French filmmaking duo’s cinema. Straub (b. 1933) and Huillet (1936–2006) were partners working intimately from the early 1960s until Huillet’s death, continually pursuing a writing and filmic practice dedicated to profoundly interpreting the art, literature, and institutions of Western culture. 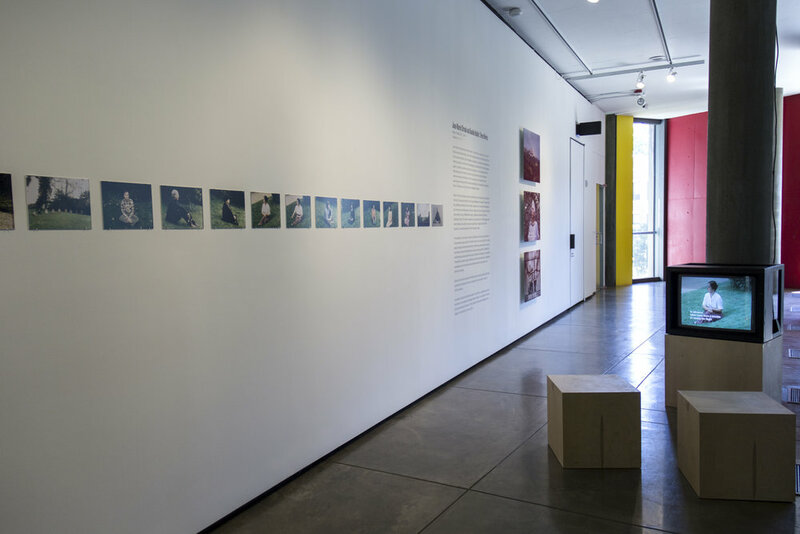 The exhibition on Level 3 features a presentation of Every Revolution is a Throw of the Dice, Straub and Huillet’s 1977 staging of Mallarmé’s poem A Throw of the Dice Will Never Abolish Chance (1897). The presentation includes the 10-minute film screened on a monitor accompanied by 20 silver-halide color prints mounted on board and a 2014 copy of Mallarmé’s poem, published by Éditions Gallimard in 1914. The second installation is a presentation of three large-scale silver-halide color prints mounted on aluminum, images from the film Cézanne: Conversation with Joachim Gasquet (1990). A facsimile of the seventeen-page script for the film A Visit to the Louvre (2004) is exhibited on Level 0. The typed pages, heavily annotated and edited by Huillet using yellow, green, blue, and red markers shows the filmmakers’ creative working process, majestically transforming typed pages into a series of abstract drawings. The exhibition Three Works presents visual referents to filmic works while each installation possesses an autonomy as active metonyms within the context of a gallery setting. Straub and Huillet’s publication Writings (2016), edited by Sally Shafto and published by Sequence Press, accompanies the exhibition and is available in the Carpenter Center’s CRC/bookshop. There will be a book event with Shafto in the September. Jean-Marie Straub and Danièle Huillet: Three Works is organized by James Voorhies, the John R. and Barbara Robinson Family Director of the Carpenter Center, in coordination with Miguel Abreu Gallery, and is a selection of works from the exhibition Films and Their Sites presented at Miguel Abreu Gallery from April 24 to June 19, 2016. The exhibition is realized in connection with the film series Jean-Marie Straub and Danièle Huillet at the Harvard Film Archive from September 15 to October 15, 2016, originally organized by Joshua Siegel, Curator, Department of Film, Museum of Modern Art, New York. United States tour of the films is organized by Thomas Beard. Special thanks to Miguel Abreu, Jean-Louis Raymond, Katherine Chan, Katherine Pickard, Barbara Ulrich, and Jean-Marie Straub.